This article was contributed by YPG member Mackenzie Brady. If you are a YPG member and would like to contribute articles on publishing-related topics for our site, please contact Tara Powers at tpowers@wwnorton.com. While e-books were already in the book ecosystem since the mid-1990s, in 2007, Amazon revolutionized the way people read when it introduced its own electronic reading device: the Kindle. In the time since, many other companies have developed or enhanced their own e-readers or tablets, giving readers a greater variety of devices and expanded access to books on the go. But just how many readers are using electronic devices, and what exactly are they reading? Is the YPG demographic representative of the population as a whole in terms of their attitudes toward e-books and e-readers? While the prevalence of electronic books and reading devices suggests their inevitable longevity, the landscape of electronic publishing seems to be changing faster that the temperature these days. In honor of that fact, I’ve compiled a list of recent trends and polls that might be useful in parsing the current electronic market. According to an eMarketer survey published in May of 2011, the number of e-readers purchased in 2011 rose by 60% from 2010 levels, and it was estimated that another 20 million e-readers would reach consumers by the close of last year (1). 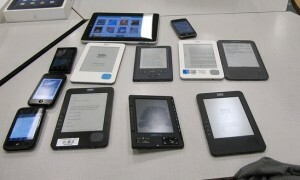 By 2012, 12% of all adults were estimated to own a Kindle, Nook, Kobo, or similar device. As for who is buying these e-readers, the New York Times reported in January of 2012 that the increased ownership of tablets/e-readers was especially pronounced among highly educated people with yearly household incomes of more than $75,000 (2). It was also reported that almost one-third of all people with college degrees now own tablets. Even as e-reader sales hit record-breaking levels, though, the Los Angeles Times reported on April 14, 2012, that more than 50% of the readers they interviewed still read most or all of their books in print form, despite each person’s owning an e-reader (3). As for the types of books people are reading on their e-readers, two genres appear to be skyrocketing in popularity: religious literature and children’s/YA. The Association of American Publishers released a report in January of 2012 that highlighted the impressive growth seen in sales of religious e-books (a 150.7% increase from 2011) and sales of children’s/YA e-books (a 475.1% increase from 2011) (4). The adult market also enjoyed a bump in e-book sales with a 49.4% increase from 2011. Susan Katz, the president and publisher of HarperCollins Children’s Books, was quoted by the New York Times in February of this year saying that “adult fiction is hot, hot, hot in e-books, and now it seems that teen fiction is getting to be hot, hot, hot” (5). AAP Vice President Tina Jordan, who oversees the AAP statistical reports, feels that the powerful rise in e-reader devices speaks to the relevance and permanence of the industry and its continued willingness to innovate. “The dialogue around reading is about consuming quality works, good books with good content, whether the delivery be in an electronic or print form. The revolution of e-readers has gotten consumers even more excited about the expansion of content access and consumption,” says Jordan. To get a sense of the collective attitude toward e-books in the YPG demographic, a poll was sent out to all members in April’s newsletter. Among the 103 members who completed the survey, the results were, of course, quite interesting. When asked if they owned an e-reader, 73 people said yes; an additional 17 said yes, though the device was owned by their company; and 23 people said they did not own one. Of those e-reader owners, the Kindle was the most popular with 43 owners, followed by the Nook with 26 owners, both the iPad and Sony with 9 owners each, and 1 “other” device. In terms of the content most often read on e-readers, 33 members read mostly published e-books, 24 read mostly manuscripts, and 29 read a combination of the two. The most interesting fact, though, was that when asked whether they preferred print or electronic books, 93 YPG members preferred print, whereas only 12 preferred electronic. I shared these statistics with a few publishing colleagues and fellow YPG members, wondering if they thought the poll results were truly indicative of our demographic’s view. Most of the junior professionals that I spoke with informally were unsurprised with the findings, noting that several of the devices seem to be making some interesting innovations. Editors in particular, it seems, are finding e-readers increasingly useful for work purposes such as reading manuscripts that they don’t want to lug around, but overall—although most interviewed YPG members admitted there was room for an eventual change of attitude—it was agreed that, for the moment, reading physical books still remains an irreplaceable pleasure. As both electronic books and reading devices continue to evolve, so too will the opinions and statistics surrounding them. But however unclear the future face of publishing may seem, one thing appears certain–there will always be a need for content; there will always be readers. Mackenzie Brady is currently an assistant at the Charlotte Sheedy Literary Agency. She has also worked at Farrar, Straus & Giroux, as well as FinePrint Literary Management. You can follow her on Twitter (@MackenzieCBrady) or email her at Mackenzie@sheedylit.com.